Where to Buy Celsius Herbicide, Celsius WG Herbicide - 10 oz - $118.95 for Sale with Fast Free Shipping! Celsius WG Herbicide - 10 oz controls more than 150 weeds including many difficult-to-control broadleaf and grassy weeds like crabgrass that safe to use at high temperatures and gives LCOs the freedom to make post-emergent applications when it’s convenient for them. The soil activity of Celsius provides a barrier of control for up to 60 days after the application is made. Safe for use year round on the most important warm-season turf types like Bermuda, Centipede, St. Augustine, Zoysia. • Celsius controls weeds at high temperatures, allowing the turf to reach its optimal density during the most favorable time of year for growing warm-season grasses. There is no better weed control than dense and healthy turf. • Unlike some other post-emergent herbicides, LCOs can feel confident applying Celsius because it is safe to use year round at high temperatures on St. Augustine and centipede turf without risk, damage, or fear of significant phototoxicity. • Celsius is a post-emergent herbicide. With some pre-emergent control, Celsius also allows turf to release into areas where weeds once lived. • Celsius features two new actives – iodosulfuronmethyl-sodium and thiencarbazone-methyl – and gives turf managers a new tool for managing resistance to some existing post-emergent herbicides. Celsius has three use rates depending upon the weeds that are to be controlled. The annual use rate for weeds can vary from 2.5 - 4.9oz./acre in a single application to a maximum use rate of 7.4 oz/acre annually. Celsius uses 25-75 percent less active ingredient than current post-emergent herbicides. This 10 oz Bottle covers up to 4 acres. Strong herbicide at a good price. This bottle could potentially cover for an entire year and even more, depending on the size of your property. Got rid of Buttonweed very well last year. Stocking up on Celsius again this year. It's at a reasonable price unlike some specialty herbicides, while having the effectiveness of a top class herbicide. I works very well. Extremely effective at killing pesky unwanted weeds. This works great. Works very well, on top of this price and fast shipping, 5 stars! This product is my go to herbicide for weeds in centipede and st.augustine lawns. Works great without worries of damage to lawn. Covers many more weeds than other products. Can be used when temperatures get hot as well. Simple measure container supplied makes for a simple clean quick mixing. Wish it was a little less expensive though. Was getting it for $80 a bottle but not any more. This product works great and comes sealed with a tamper evident hologram from the manufacturer to ensure quality. I used it on Centipede grass to get rid of a stubborn weed, Virginia buttonweed, that I have not been able to kill over the past 5 years without damaging the Centipede. This product killed it right away with no damage to the Centipede. A great product, indeed. For the money the best product on the market for the variety of weeds that it will take care of. This is the best herbacide I have used yet. Works exactly as claimed also. Great to finally have a product to use when temperatures are high. Best product for the best price plus free shipping. 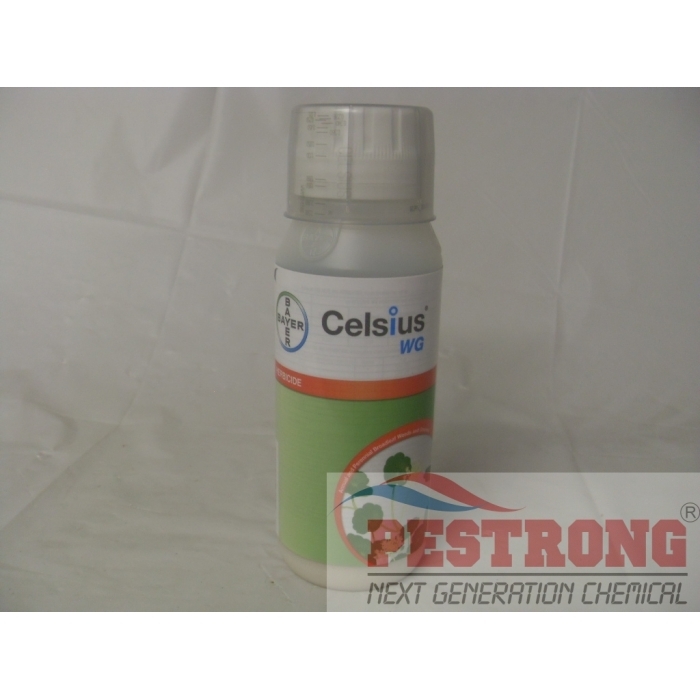 Pestrong has the best selection and best prices anywhere for a great product like Celsius. Works good on spurge and cud weed. This stuff is great.Love dealing with you guys.Quick and easy! Excellent replacement for msma. It works.